Quincy, the mechanic, returned with the rebuilt alternators and, with a little more investigating, found the reason we’d had so many problems – the marine regulator had gone bad and was feeding current back into the alternator. We visited the National Quilt Museum in Paducah, KY which we both thought was well worth the time. Before leaving Buzzard Rock Marina, we still had a couple of days of chores to do. 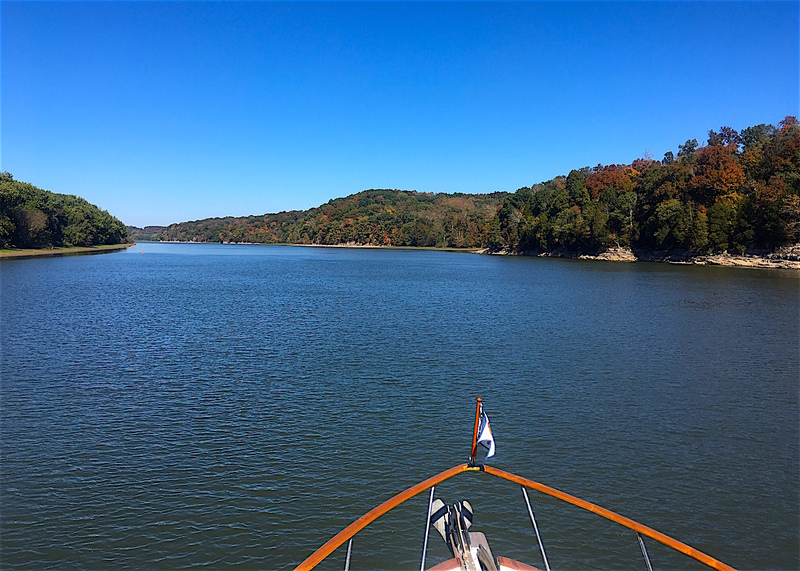 On the 13th, we pulled out of Buzzard Rock and turned south on the Cumberland River towards Nashville. Terry and Marge Mortenson would be joining us there for a few days. We found the Cumberland to be a combination of wide lake-like areas and river-style channels with many beautiful houses along the way. There was lots of bird life including bald eagles, egrets, large flocks of white pelicans, and lots of turtles. 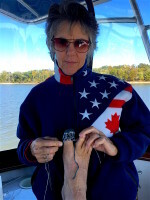 We anchored out the first night and then tucked into a covered slip in Clarksdale Marina the 2nd evening in the rain. The next night was in Rock Harbor Marina, built in an abandoned rock quarry. It was nice, but because some of the boats did not park with any consideration for others, we had no power. We also had a strange banging on the boat hull all night. (See the details for the answer to the mystery.) First thing in the morning, we got LC down and scootered to Nashville Cowboy Church. Dr. Harry Yates, husband for 44 years to Johnny Cash’s sister, Joanne, pastored the church. The worship, while not “normal” church music for us, was great, including several songs by Joanne. 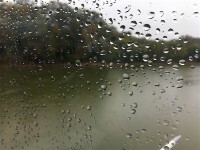 In the afternoon, we moved a couple of hours upriver to the Nashville City Docks, where we again had no power. After getting settled, we walked across the river and had dinner in a small restaurant in Nashville, then walked the main street with country music blaring from every bar and restaurant, of which there were many! As a matter of fact, it seemed the only businesses downtown were bars, restaurants, and boot stores! 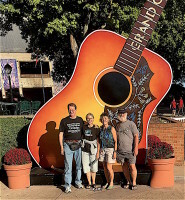 In the morning, Ron & Marie Adams, who had been with us in Canada, came to tour Nashville with us. We had a fun day with them, including a great BBQ lunch at Loveless Motel and Café. The next day Terry and Marge arrived and we headed off for a backstage tour of the Grand Ole Opry, followed by dinner and the showing of Kirk Cameron’s “Revive Us.” In the morning, we loosed our lines and headed back toward Buzzard Rock Marina, this time heading downriver and gaining a couple of knots speed. We enjoyed a nice anchorage and dinghy ride up the Harpeth River. After dinner, Terry had enough coverage (and data) to watch the last presidential debate. The next night was back at Clarksville Marina where we took a longer than anticipated walk to dinner at a German bakery. We pulled out on the river to a bright but cool day. After 36 miles, we spent the night on anchor behind Dover Island but awoke to dense fog which delayed our departure. 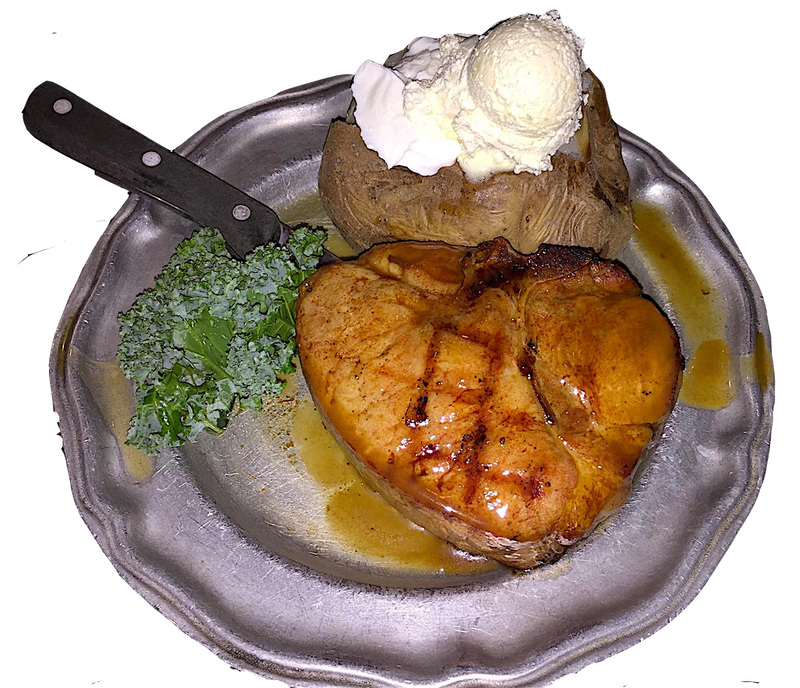 Once enroute, we traveled the last stretch back to Buzzard Rock, where we all piled into the marina’s old truck and headed to Patti’s 1880 Settlement for pork chops. Wow! What a great trip. It was so relaxing to gently float down the river. We had wonderful weather—really warm the first couple days, then cooled off but still very pleasant with a light jacket. 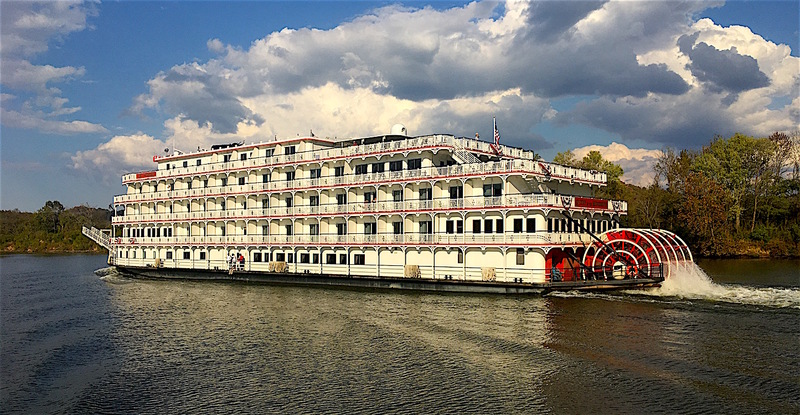 We have never been on a boat like this and enjoyed seeing how everything works and what river traffic and marinas are like—a whole different world. After a very challenging and stressful last four months, thank-you, Tom and Paula, for your wonderful hospitality and fellowship! Now you can relax! The next couple of days we spent cleaning up the boat, fixing things (not sure if that was “still” or “again”). We also made another trip to Paducah and the urgent care facility to deal with a rash Paula developed which was driving her crazy. Early the next morning we cast off and reentered Barkley Lake, crossed through the Kentucky Lake Canal, and headed south on Kentucky Lake, which was actually upstream on the Tennessee River. The fall colors were not as bright as we had hoped, but they were still magnificent! Well, this is your breaking point. It is where the overview stops and the details start. Feel free to read on, or just browse the pictures, most of which you can click to expand. Thanks for stopping by! 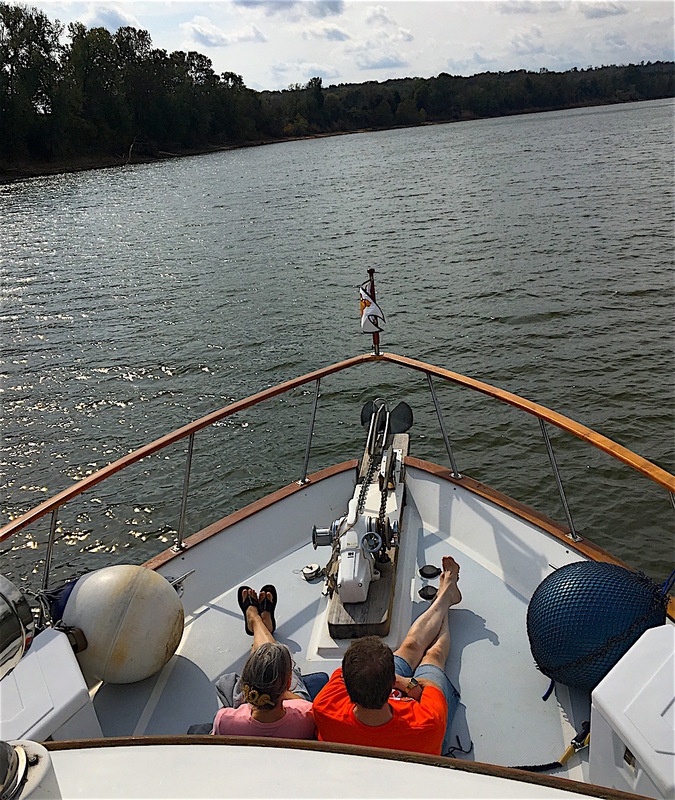 Details – We returned to the boat on Oct 11 through Nashville, taking an Enterprise car back to Buzzard Bay Marina. The boat was quite dirty with bug droppings, but the spiders weren’t as bad as the last time we had left it for an extended period. Quincy, the mechanic, arrived at 9:00 with 3 rebuilt alternators (the 4th was unrepairable) and reinstalled two on the main engines leaving one as a spare. 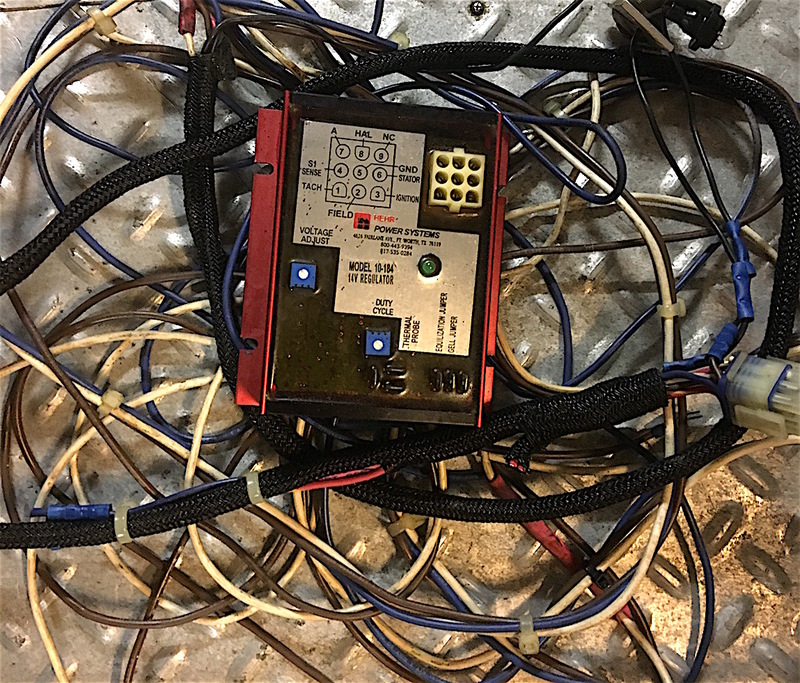 Knowing the alternators had been “fried” on the inside, he and Tom analyzed the add-on marine regulator the previous owner had installed and determined it was the problem. Finally…perhaps we had determined the reason we had been through 5 alternators since we bought the boat! Quincy also adjusted our synchronizer (the device which keeps the 2 engines running at the same RPM) while he was there. We once again borrowed Buzzard Rock’s courtesy car and made the drive to Paducah to return our rental car. While there, we toured the National Quilt Museum. Even Tom thought the museum was amazing! It was started by Bill and Meredith Schroeder of Paducah, who were in the publishing business. People kept asking if they had published any books on quilting (“no”) and they began investigating quilting and became enthusiasts. They discovered contests for quilters did not award prize money so they founded the American Quilter’s Society to reward winners financially. 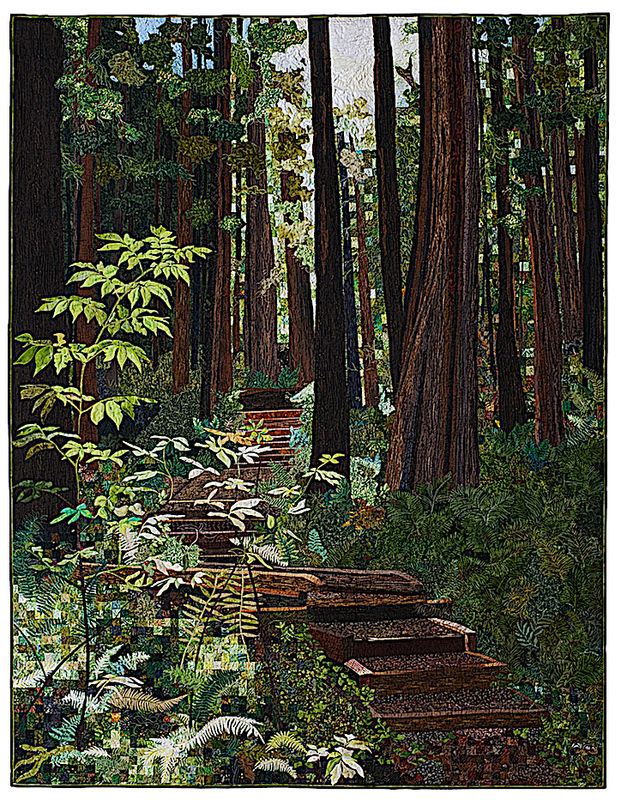 Their vision was to celebrate the work of today’s quilters and advance the art of quilting by bringing it to audiences who had previously not experienced the art form. Their $2.2 million facility was the largest facility in the world dedicated to quilting. Museum exhibits changed 8 to 10 times per year, with 50-60 quilts on display at any one time. When the museum opened, it had 85 quilts; today it has over 500. 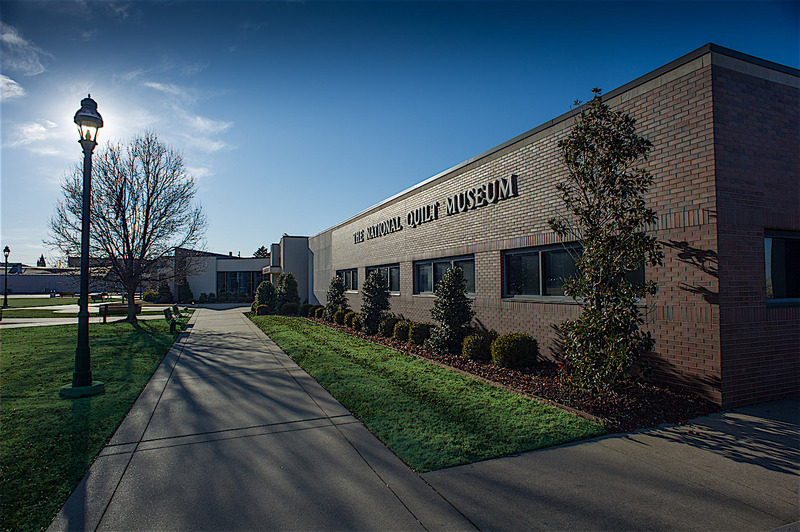 Each year the winning quilts at the American Quilter’s Society Paducah Quilt Show are added to the museum’s collection. In addition, each year it receives thousands of submissions for consideration. The museum pays $20,000 for best-of-show quilt, $10,000 for best machine quilt, $10,000 for best hand quilt, with several other categories down to $3,000 for best miniature quilt. 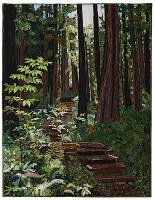 Independently, we both chose the same favorite from among those on display, Forest Walk, a forest scene with steps leading toward the trees that seemed incredibly 3-dimensional, pulling us forward into a lovely forest walk! 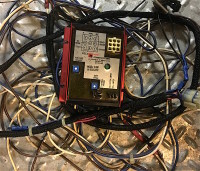 After lunch at Olive Garden and some necessary shopping, we returned to the boat for Tom to purge Life’s Travails of the faulty marine regulator and its associated wiring which had caused so many problems. Boat jobs consumed us the next day, including 4 hours of outside cleaning. Afterward, we moved the boat from next to the covered slips to the face dock, hoping further distance from the overhanging roofs might keep our boat cleaner. It rained overnight (an additional cleaning rinse) and was quite cool in the morning with overcast skies. We finished our boat cleaning and moved to the fuel dock for a pumpout, which was still not working well. 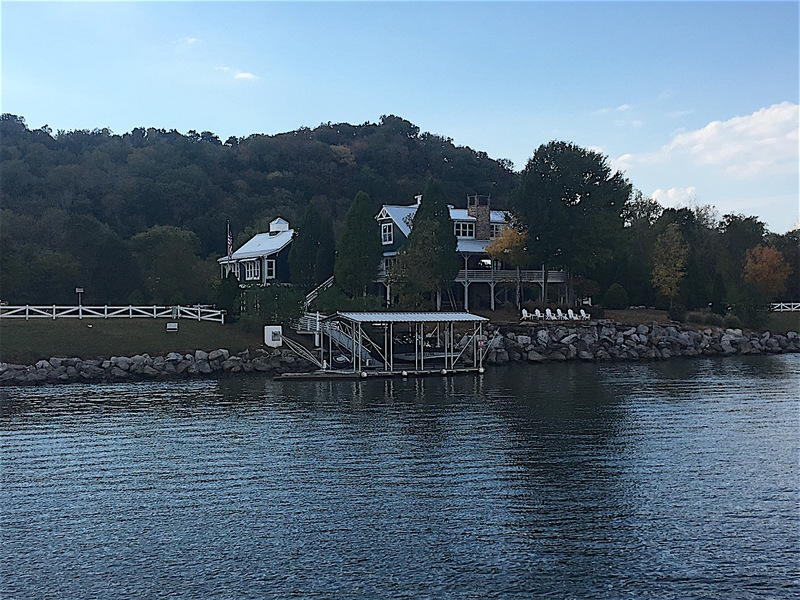 It was a late start (11:30), but out on the lake it was a very calm day as we headed for Nashville to meet Terry and Marge Mortenson who would be our guests for the return trip to Buzzard Rock. Though we were layered 4 thick with the cold, it was a lovely day. The leaves were beginning to turn fall shades. Tom saw hundreds of his favorite pelicans and we saw lots of buzzards, 2 eagles, and 3 deer! After 51 miles, we anchored behind small Dover Island just before sunset with 3 other boats rafted together. After a game of Qwirkle, it was off to bed. Under overcast skies, Tom put a polypropylene float line on the boat end of our anchor chain. (Its purpose was to lead us to the submerged anchor if the anchor chain somehow became detached from the boat.) 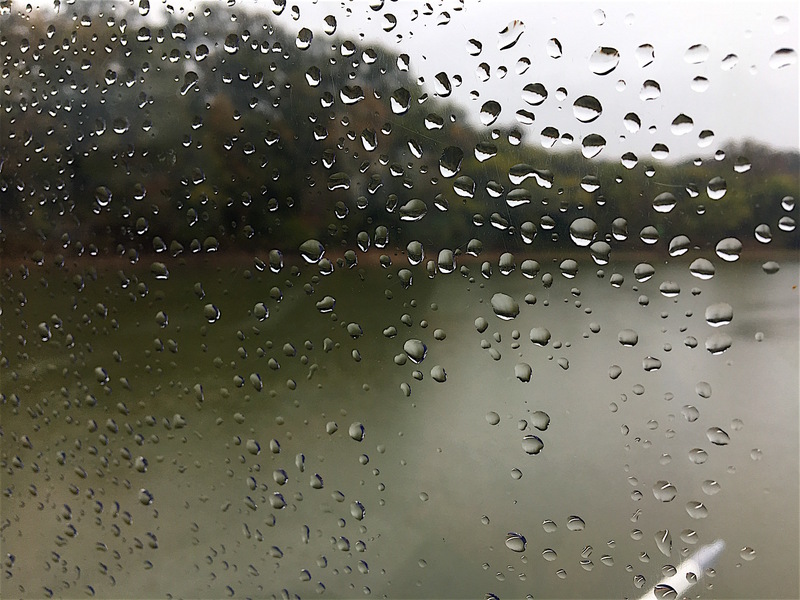 By the time we pulled the anchor to depart, it had begun raining and the rain continued during the entire 58 miles of our day, putting rather dreary light on the trees. We didn’t make our goal of Harpeth River anchorage for the night, but were able to secure a covered slip at Clarksville Marina. It was good to get out of the rain. Once there, we met Loopers Steve Hidalgo and Kevin (female) Flanagan on Lone Star (one of the boats anchored near us the night before) and Loopers Berrlin and Debra Collins on Satisfied Frog. Actually, Berrlin and Debra weren’t sure they were actually Loopers yet. They had just finished their first solo day on their boat after their training captain, who helped bring their boat from Cincinnati to Nashville, had left. They weren’t sure they actually got to count their time as “starting” the Loop until they got to Barkley Lake. We told them they got to count it! After touring their beautiful 15-year-old boat that looked brand new, we all walked up the hill to a delicious dinner at the Liberty Park Grill and discovered the name of their boat was from the restaurant of the same name in Cave Creek, just 20 miles from our home where we had eaten numerous times. They previously owned a house in Phoenix and it was one of their favorite restaurants. Saturday morning there was light fog and we took the time to re-measure our air draft. Our location under the covered slip gave us our first really accurate measurement, as we could measure from the crossbeam just above us. We got a free pumpout (we didn’t feel the one at Buzzard Rock was complete) before leaving. It was a much nicer day and once the sun came out, we finally were able to shed our long pants for short. It was a pretty run for the day, with lots of small islands. Tom spotted sunning turtles and, after a 30-minute wait to traverse the Cheatham Lock, were treated to lovely parks alongside the river. One even had a volleyball net in the shallow water. We passed the Queen of the Mississippi paddleboat, even more majestic on the river than when we had seen it alongshore earlier. 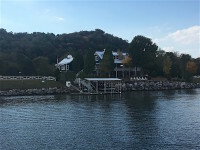 Our destination for the night was Rock Harbor Marina just on the outskirts of Nashville, as we hadn’t been able to secure a reservation at the Nashville City Docks located in town at the base of the stadium due to a weekend Titans game. 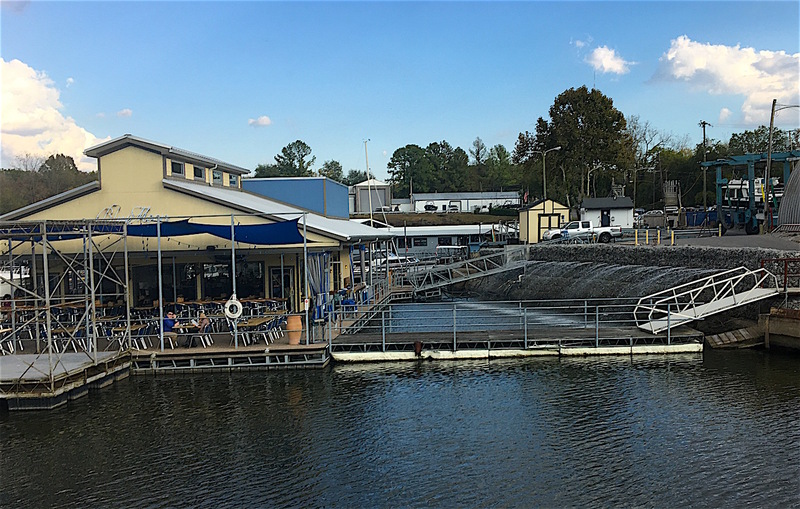 The marina was small, but had a very pretty entrance into the former rock quarry, with sprayers next to their Blue Moon Restaurant and a small waterfall adjacent to our face dock. We pulled in right behind Lone Star. Unfortunately, there was no power pedestal, but we were able to reach the one in an empty slip nearby long enough to cool down our boat before the owner returned and needed his power. We ate at the Blue Moon for supper. We’d heard mixed reviews of it with some saying it was delicious, while others said it was just OK food with good ambiance. We’d go with the second opinion, although Tom did enjoy his chocolate mouse dessert! Back at the boat, we heard knocking in the V-berth and investigated. 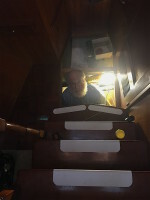 It seemed to be on the hull, and Tom swept a boat hook under the boat outside to see if something was below. He said he felt something, which he swept away, but the knocking continued. It sounded like someone pounding on the boat with a hammer, a wooden floor creaking under the weight of someone walking on it, or a fish tail flopping against a tin surface. Later, the noise moved to the aft, then was both places at the same time. Tom could only surmise something was “grazing” on the bottom of our boat. We found out later it was Asian Carp eating the algae. Even wearing earplugs in bed only cut the noise to a muted level and it continued through the night. At around 3:00 AM, it seemed to subside a little (maybe the fish were nearing “dessert”), but never stopped completely. When we got up in the morning, we lowered LC and were off to the Nashville Cowboy Church. 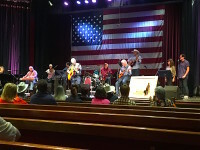 The band consisted of 10 members – lots of guitarists including a slide guitarist, pianist, drummer and singers. Guest soloist was Gerald Smith. For those of you who are old enough to remember, Gerald earned famed on Hee Haw as the “Georgia Quacker,” the guy who make duck quacks. He was a songwriter and played 3 songs he had co-written, which had excellent words. Though neither of us were country music fans, we were both very impressed with the quality of music. 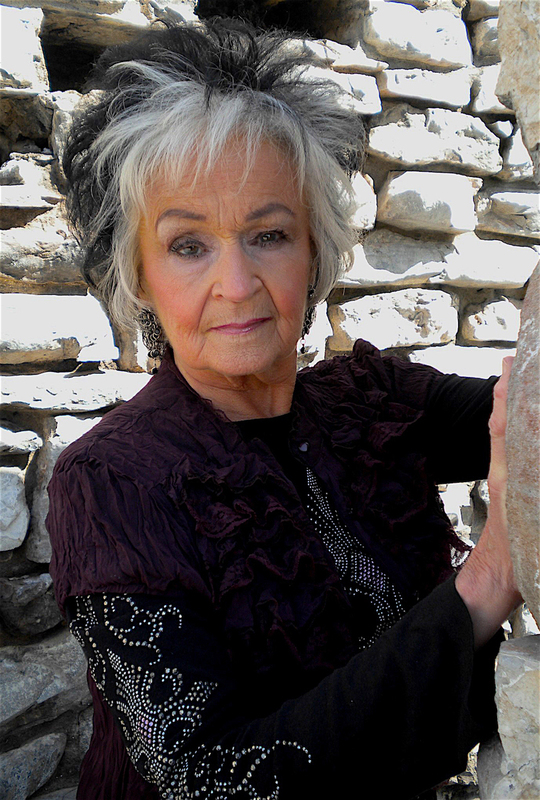 Joanne Cash Yates, age 79, also sang 3 songs. (She was currently cutting 2 more albums and writing a book about growing up in the famous Cash family.) There were sure some excellent voices in Nashville! 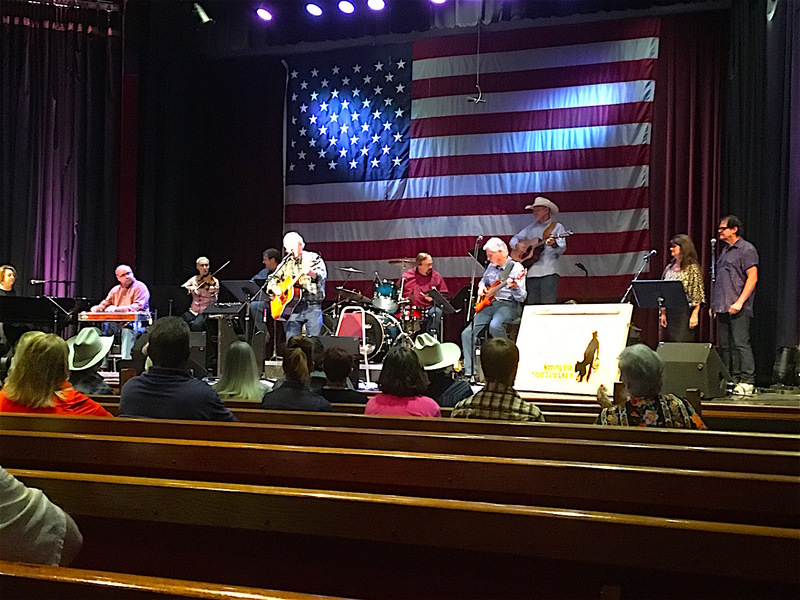 If you want to check out the church, Nashville Cowboy Church’s services are on-line every week. Pastor Yates gave a short message on Job 32:7, reminding us we should learn and increase in wisdom every day of our lives. 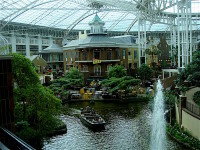 After church we toured the huge Grand Ole Opry hotel with its 3 large atrium gardens. 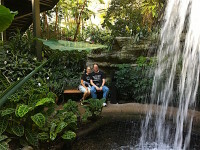 They had an amazing variety of plants and flowers with waterfalls and even a river on which you could take a boat ride. It was all beautiful, as nice as any arboretum which charged admission. We found out the previous day we were going to be able to move to the Nashville City Docks immediately after the game on Sunday instead of having to wait until Monday. Though only about 5 direct miles, it was a twisty, meandering river. We timed it to make the 2-hour, 15-mile move to arrive at 4:00. The dock at the base of the stadium was shorter than we expected, with room for only about 4 boats. 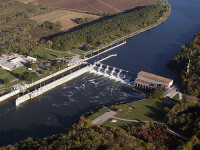 (The unsecured dock across the river could hold 8 boats.) There was only 1 very large houseboat (120’) on the east dock, and we snatched the downriver end space, which made it pretty easy to secure without help even on the very low dock. Unfortunately, once again, we had no power, as it kept tripping when we tried to connect. There were also no restrooms, showers, or any other services, but the cost was the same as a marina. Oh well. 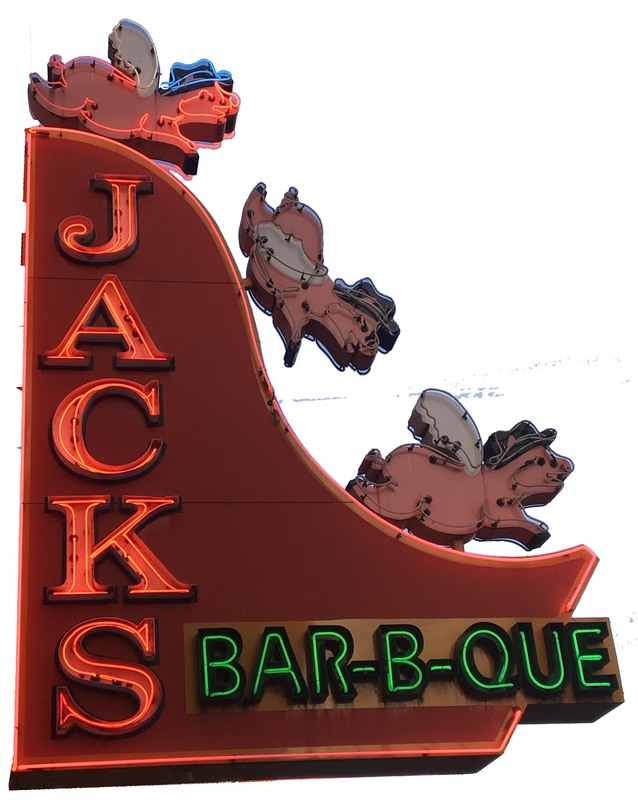 Location, location, location…we were in downtown Nashville. The boat was hot, so we walked across the river to downtown. We were not impressed with our first exposure to Nashville. It consisted of blocks of bars with country singers and restaurants filled with post-game revelers. 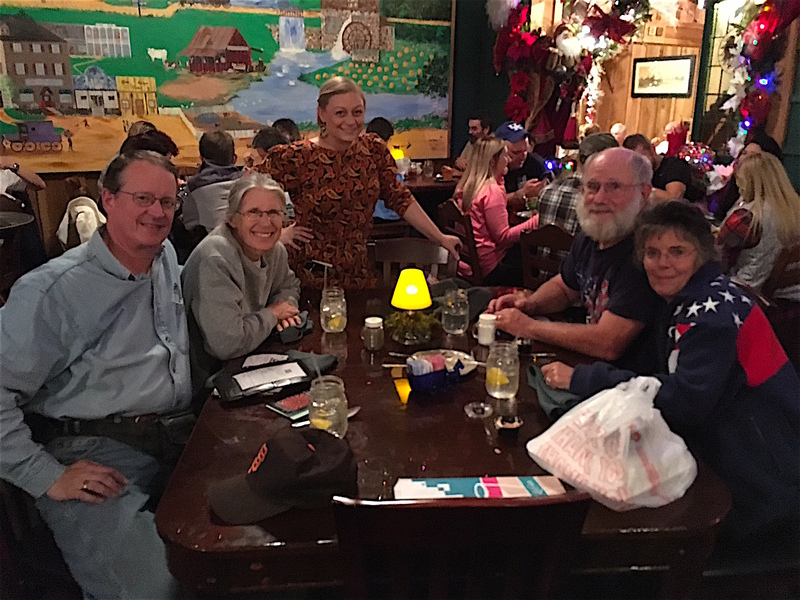 The restaurant suggested to us by John and Carolyn Hopple, friends from Phoenix who had been in Nashville just weeks earlier, had about a 2-hour wait (way beyond our limit). Once back at the boat, we sat out on the aft deck until the generator cooled down the interior enough to be comfortable. Once again, we heard knocking noises on the hull, but it was not nearly as loud as at Rock Springs Marina. At 9:30 Monday morning, Ron and Marie Adams, who had traveled the Northern Channel with us, arrived. 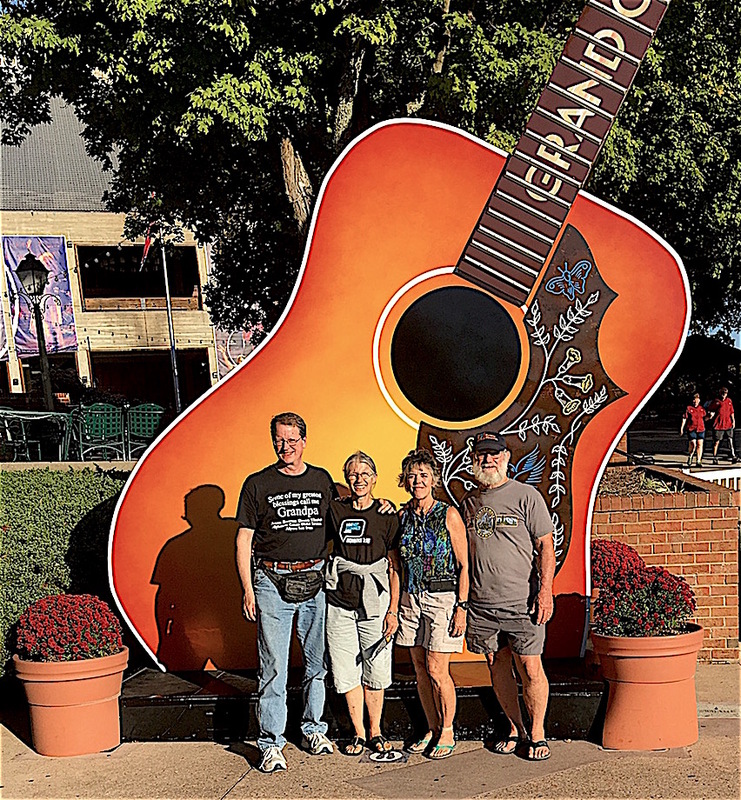 They had taken a 3-month job with Amazon in Murphysboro, TN, which was less than a 1.5-hour drive from Nashville and had agreed to drive up and see Nashville with us. It was great to see them again! We started with a short stop at the Nashville Visitor’s Center to pick up some maps and organize our day’s events. We drove past the Ryman Auditorium, the location of the previous Grand Ole Opry, then took a beautiful drive through the expensive Belle Meade neighborhood to ogle over the old houses. From there, we continued onto the Nachez Trace Parkway to the Loveless Motel and Café for lunch. The Loveless Café’s owners, Lon and Annie Loveless, first served its famous fried chicken and biscuits to hungry travelers on Highway 100 in 1951 and today serve over half a million visitors every year. With a 45-minute wait for lunch (normally beyond our limit, but it had gotten great recommendations), we wandered around the property through the barn and stores. George Harvell, the pit master struck up a conversation with Ron because of Ron’s “I love Jesus” hat! He was a believer too. 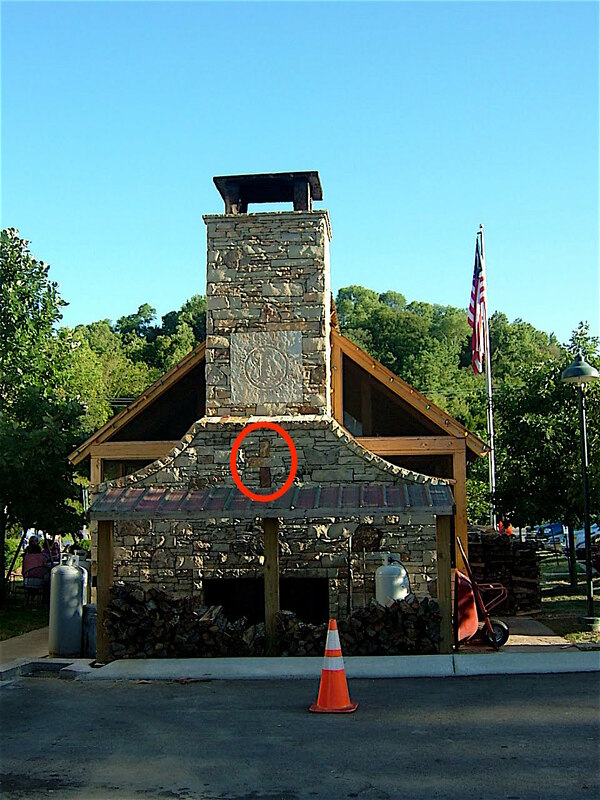 He proudly shared his smokehouse with us and told us about the cooking process. Four mornings a week, he arrived at 2:30 to put up to 25 pork loins in his hickory wood-fired oven, slow-cooking them for 24 hours. We loved talking with him and after Tom gave him a Canyon Ministries card and told him what we do, he proudly showed us a picture on the wall of his smokehouse in which he and his grandchildren were padding the Ocoee River with big grins on their faces, his perhaps the biggest. He wanted to come to the canyon. He also showed Tom the stone cross in the back of the smokehouse which he had the stonemasons install. He wanted all glory for his cooking to go to God. After a delicious lunch of fried chicken, BBQ pork loin, (Tom had fried catfish), country ham, homemade biscuits and jams, and country vegetables, we drove to the Upper Room Chapel and Museum. Their chapel had an almost life-size wood carving of Da Vinci’s Last Supper. We watched a 20–minute film on the Upper Room and information on the carving, which detailed each of the disciples with Jesus at the table. We drove Music Row, lined with recording studios and on to Centennial Park where we enjoyed the 1-mile walking trail around Lake Watauga and the Parthenon. Nashville, also known as “Little Greece,” had an exact full-size replica of the Parthenon in Athens. The Parthenon housed an art exhibit but was closed on Mondays, so we weren’t able to get our culture for the day. We continued on to Bicentennial Capital Mall State Park to hear the 95-bell carillon chime at 5:00. We enjoyed the music. Though we weren’t real hungry, we had more delicious BBQ at the Hopple’s favorite Jack’s Flying Pig downtown. Our time with Ron and Marie would not have been complete without another game of Qwirkle, so we finished our day with it before Ron and Marie had to return home. What a treat to see them again! 1:30 and we set off sightseeing again. 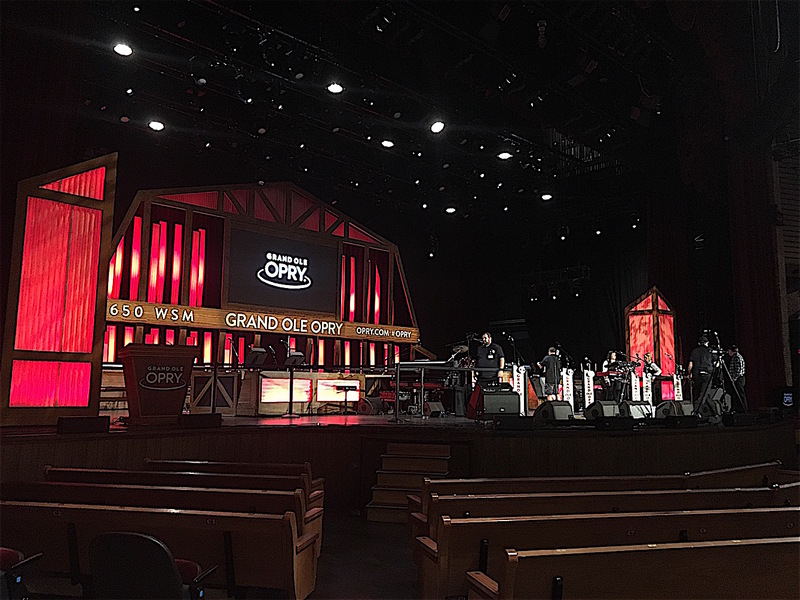 We started with a much-anticipated backstage tour of the Grand Ole Opry. We got to see the entrance through which performing stars arrive as well as their 18 themed dressing rooms. 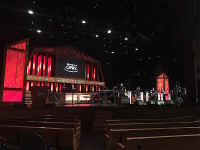 There are currently 65 Grand Ole Opry members, an exclusive “club” whose membership came only by management invitation. The Opry had a family atmosphere. No alcohol was allowed backstage, only 2 dressing rooms had private bathrooms, and there was a living room in which performers could lounge before they were called on stage. Then we got to walk on the Grand Ole Opry stage and stand in the 5’ wooden circle from which all the stars perform. This wooden circle was a piece of center stage moved from the previous Grand Ole Opry location at the Ryman Auditorium, an important piece of country music history. 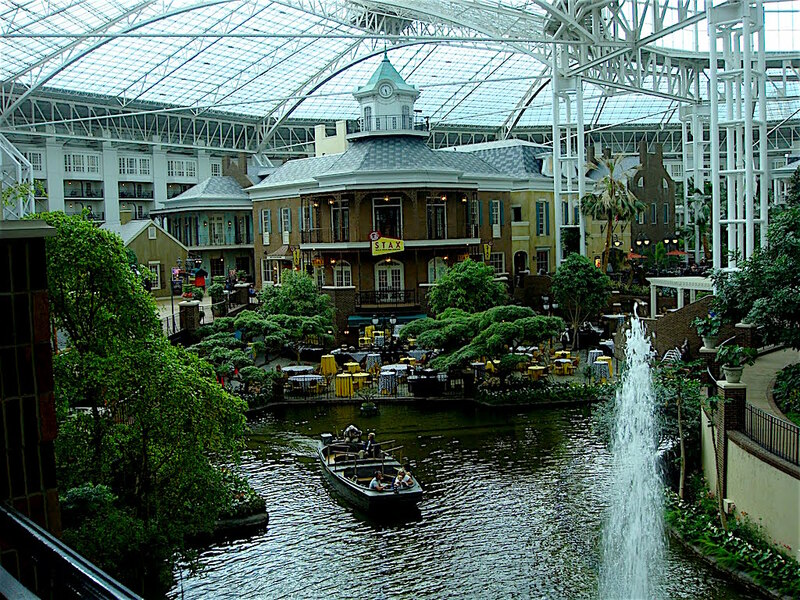 From there, we took Terry and Marge to the Grand Ole Opry Hotel to show them the 3 beautiful atrium gardens. Dinner at Caney Fork nearby set us up to go to the Grand Ole Opry theater for the showing of Kirk Cameron’s Revive Us. It was a live event held at James McDonald’s Harvest Bible Church in Chicago for the purpose of giving hope to Christians that our hope is in God, regardless of who was elected president or the moral condition of our country. Guests included Dr. Ben Carson, Eric Metaxas, James McDonald, Francis Chan, Jennifer Rothschild, and “Miss Clara” from the movie, War Room. The health of the US was likened to a sick patient. Dr. Carson suggested the patient (our country) was in ICU but was not incurable, and went on to discuss some of the signs of our sickness. Eric Metaxas gave historical data upon which the US was founded – morality, faith, and freedom. James McDonald and Francis Chan gave Biblical application to the sick patient and Jennifer Rothchild (who was blind), helped us see with spiritual eyes what those of us who are seeing often fail to see. Miss Clara prayed God would raise up warriors to fight for our country. In between, we worshipped with 3 different bands. Finally, the panel fielded 3 write-in questions from the audience, expertly answered. It was a very uplifting. Early the next morning, Terry and Tom drove their van to Rock Springs Marina where Dave Benson, the boat broker we met on the Mississippi River who lived in Nashville and told us to let him know if he could ever help us, met them. Dave had made arrangements for Terry and Marge to be able to leave their car there while they traveled with us. Then Dave brought them back to the Nashville City Docks. Shortly after, we pulled out on our way back down the Cumberland to Lake Barkley. It was a peaceful, clear day and though there was more color in the leaves, they were still not bright. 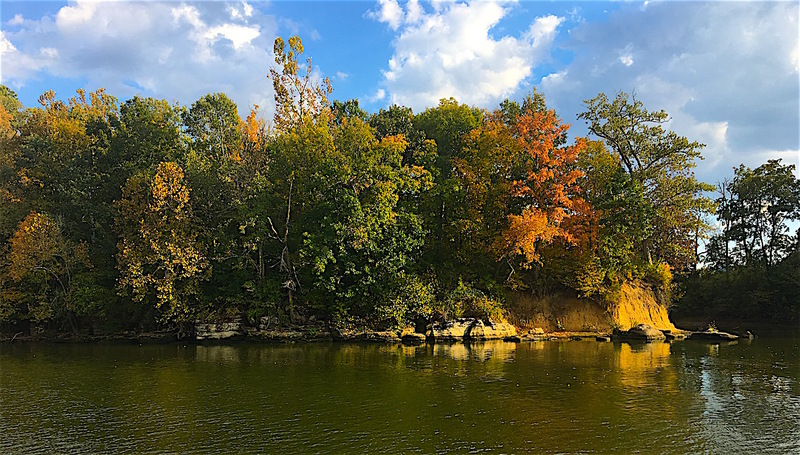 After 37 miles, we anchored in the Harpeth River, lowered the dinghy and went exploring. On the aft deck, we enjoyed the sun and taught the Mortensons our favorite game, Qwirkle. Tom won the first and after supper, Terry took honors. Wednesday’s forecast was for thunderstorms with 90% chance of rain; it was overcast all day with intermittent rain. We had a 25-minute wait for the Cheatham Lock and then docked early (with only a 23-mile day) at Clarksville Marina. We arrived just in time – the black sky let loose and dumped rain about 15 minutes after our arrival. Paula did 2 loads of laundry while the weather cleared and Marge studied the Clarksville tourist book to see what we might do. We thought Clarksville was a small, quaint historical town, but as we walked to Silke’s Old World Bread, a German bakery and restaurant Marge had discovered, we discovered it was much larger than we thought. Almost 3.5 miles later, we arrived at the bakery, 10 minutes before closing. They were nice enough to let us order and eat. Before we finished, it was misting light rain and the temperature had dropped quite a bit. We Ubered back to Dairy Queen, right across the street from the marina, for a Blizzard with fun driver, Michael. Terry had a DVD of the testimony of Buck Wilford (of Black Hawk Down fame) and we enjoyed it before bed. Friday dawned clear but much colder. Marge went for a run, Terry showered (mistakenly, in the women’s restroom), Paula ran another load of laundry and Tom did some computer recovery work. We pumped out the head, knowing now this would be the last time for a while, and pulled out of the marina. Other than seeing turtles and vultures, there was not much wildlife. The cool day was perfect for soup. 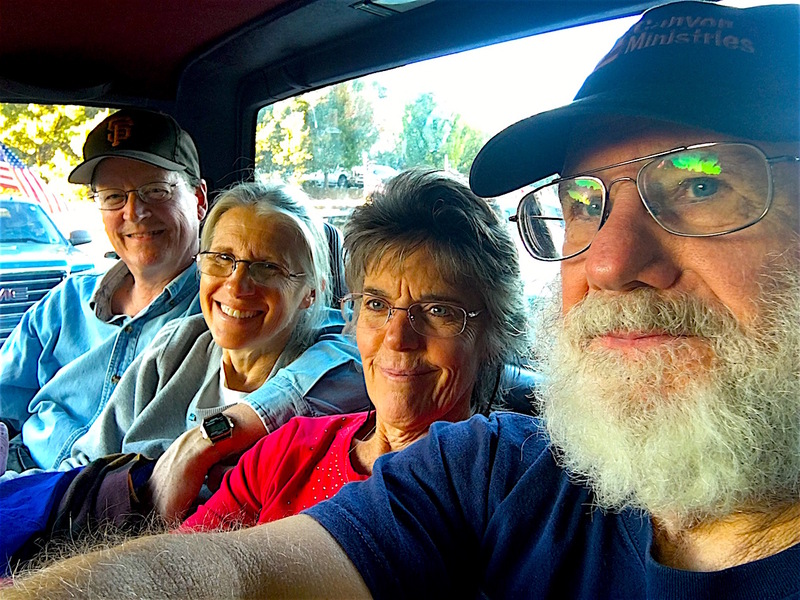 Enroute, we experienced a first of our entire trip – we were passed by a barge. He was down bound and empty and going 1.5 knots faster than we were! After arriving at our Dover Island anchorage, we played games before and after supper (Cribbage, Oh Hell, Qwirkle). We had the anchorage to ourselves during the cold overnight and awoke to fog so dense we couldn’t even see the nearby banks. That put us off to a late start for our 51-mile day (about 9:30), which caused the impossibility of the Mortensons getting a rental car before Enterprise closed on the weekend. Fortunately, AiG friends offered to come pick them up and take them back to Nashville. At 8:00 Sunday morning, we said goodbye to Terry and Marge after a really fun time with them. Once they were on their way, we went back to the boat and caught a nap. We were then able to receive our home church service via internet. That afternoon Tom worked on the starboard engine oil leak while Paula did route planning and knitted some on Tom’s new socks. It was a bad night for Paula. For about a week, she had been getting an increasingly itchy scalp near the base of her head. After only getting about 4 hours sleep, she could not stand the itching any more. We had tried Lanacane, hydrogen peroxide, hydrocortisone, and A & D ointment. Nothing alleviated it. She said if she scratched it like she wanted, her scalp would be bleeding. 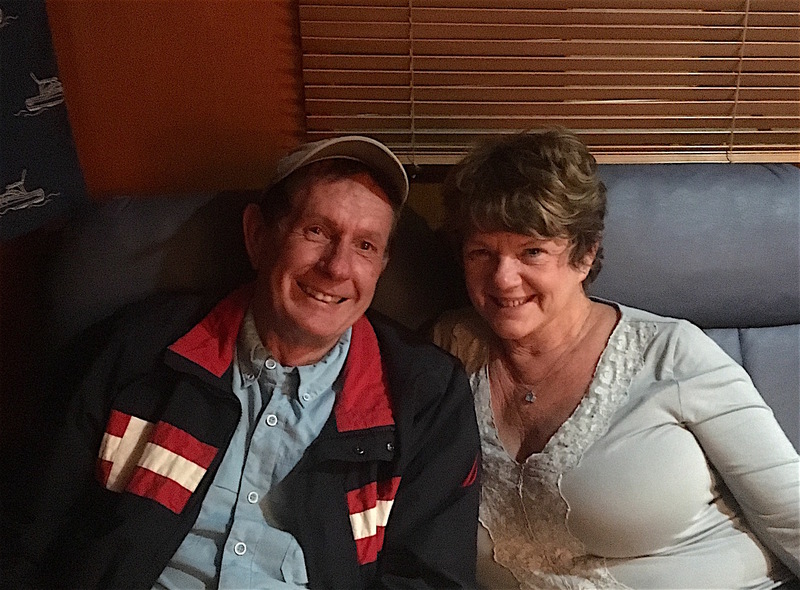 After Tom got up and the marina office opened, he borrowed the owner’s truck again and we headed for Urgent Care in Paducah. The only one in the waiting room, we got seen in 10 minutes. Though she didn’t get a diagnosis, she did get relief. A shot of steroids reduced the itching within 30 minutes to the point where she did not want to claw her scalp off anymore and could think about something other than her itching. We filled 2 follow-up prescriptions and bought T-Gel (recommended by her dermatologist brother) and some essential oils recommended by friends and her hairdresser. While in Paducah, we bought groceries and other essentials before returning to the boat for another nap. (One of Paula’s prescriptions caused drowsiness.) Then Paula did laundry while Tom did administrative chores. We had hoped to leave the next day but decided to delay a day to make sure Paula’s problems was solved and do some extra boat chores. After a much better night’s sleep, Paula cleaned every teak surface on the boat (a huge task) and did other general cleaning while Tom repaired the forward bilge pump and shower sump pump (Tom was wishing John Kelley was here to crawl into the tight bilge area). We were eager to be on our way again down the river system. Hi Paula and Tom, I lived in Smyrna and Nashville 1976-1983. This brings back memories. Cheers, Bob. Bob, so glad. 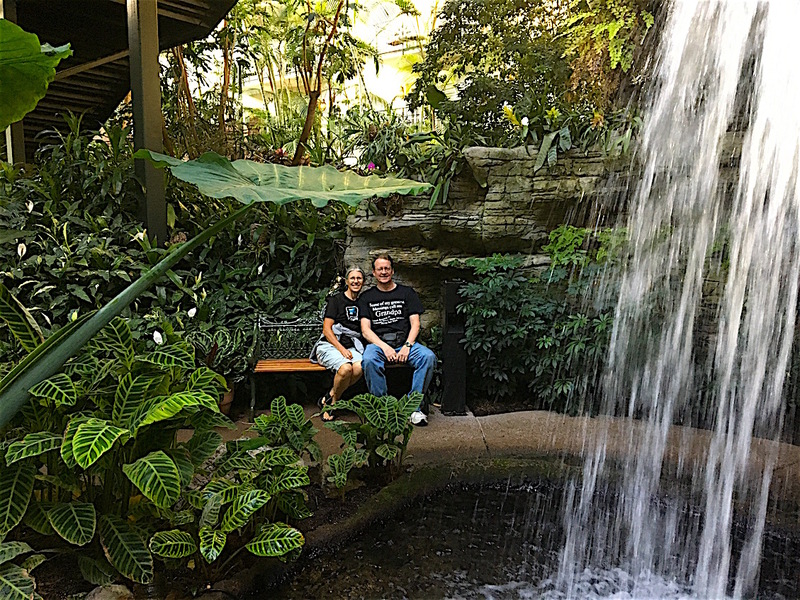 We did enjoy the sights around Nashville.